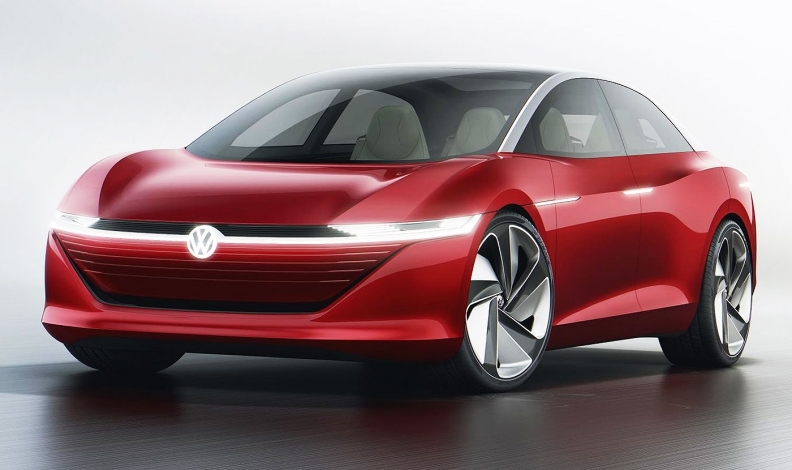 VW previewed an EV flagship with the Vizzion concept at the Geneva auto show on March 6. BERLIN -- Volkswagen Group said it will expand production of electric cars to 16 factories worldwide through the end of 2022. The automaker also said it has selected partners to provide battery cells and related technology worth around 20 billion euros ($25 billion) for EV projects in Europe and China, its two biggest markets. A deal for North America will follow shortly, VW said. VW plans to produce as many as 3 million EVs a year by 2025 across its 12 brands, which include the VW marque, as well as Audi, Porsche, Skoda and Seat. Starting next year, the group will roll out a new EV "virtually every month," CEO Matthias Mueller said at the company's annual press conference here on Tuesday. "This is how we intend to offer the largest fleet of electric vehicles in the world." VW aims to launch 80 new EVs across the group by 2025 and offer an electric version of each of its 300 group models by 2030. VW currently builds EVs in three plants. Mueller said the choice over which 16 manufacturing plants worldwide will be tasked to build EVs depends largely on which markets demand electric cars the most. VW brand is setting up the I.D. subbrand for battery-powered vehicles. The first model will be the Neo hatchback that goes on sale in 2020. Audi is set to begin deliveries later this year of the all-electric E-tron SUV. Pressure has intensified on Volkswagen to overhaul its lineup. Its diesel-cheating scandal, which erupted in September 2015, sparked a backlash over the technology, including potential urban driving bans. Diesel is key to efforts to meet tighter environmental targets because of its fuel efficiency, even though it emits smog-causing nitrogen oxides. Volkswagen reaffirmed its backing for the technology with Mueller calling it "part of the solution," even as Toyota pulls diesel cars from its lineup in Europe, the main market for the vehicles. VW said it plans to rein in spending amid the push to ramp up EV production. Development spending declined 3.9 percent to 13.1 billion euros in 2017, equivalent to 6.7 percent of sales. The company reiterated a target to lower that ratio to 6 percent by 2020. Operating profit at Audi climbed to 5.06 billion euros last year, from 4.85 billion in 2016, VW said. Underlying earnings at Porsche rose to 4.00 billion euros from 3.73 billion.